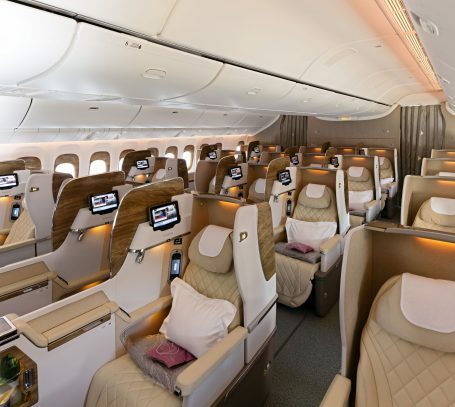 Emirates has unveiled completely refreshed interiors for its Boeing 777 aircraft, including its highly anticipated new First Class private suites. With floor to ceiling sliding doors and sleek design features inspired by the Mercedes-Benz S-Class, Emirates’ new suites takes luxury and privacy to the next level. Offering up to 40 square feet of personal space each, these spacious, fully-enclosed private suites are laid out in a 1-1-1 configuration. The entire Emirates 777 aircraft sports a refreshed interior with a light and modern colour scheme, classy textured panels, as well as new lighting and design accents. An artistic motif representing the Ghaf (prosopis cineraria) tree, is used as a design highlight throughout the aircraft. An indigenous evergreen plant, the Ghaf is a considered the national tree of the United Arab Emirates, and has deep cultural and ecological significance. The design and shape of Emirates’ Business Class seat onboard the new 777 was also inspired by the interior of a modern sports car, with a diamond stitch pattern on the full leather cover, ergonomically designed headrest, and a sleek overall look and feel. The seat has a pitch of 72 inches and moves into a fully-flat sleeping position. It also has touchscreen controls for the seat and inflight entertainment system, several personal lighting options, privacy panels between seats, a shoe stowage area, footrest, and a personal mini-bar. The Economy Class cabin now features a colour palette of soft greys and blues. The ergonomically designed seats come with full leather headrests that have flexible side panels and can also be adjusted vertically for optimum support. All cabin classes will be equipped with a new generation of Emirates’ award-winning ice inflight entertainment system offering improved and superior image quality. Each in-seat screen will feature ultra-wide viewing angles, a capacitive touch screen, LED backlight and full HD display. Emirates is the largest operator of the Boeing 777 aircraft, one of the most popular and advanced wide-bodied aircraft in commercial operation today. The airline has 165 Boeing 777s in its fleet, and a further 164 on firm order, including 150 of the next generation Boeing 777x aircraft. Today, Emirates operates the Boeing 777 to over 140 cities on six continents from its hub in Dubai.